I've been saying this for months but it's still true. 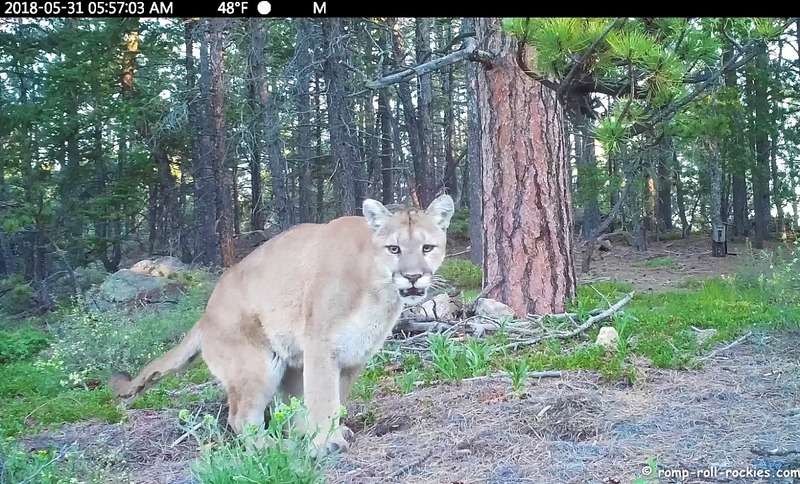 We are in an unprecedented phase of mountain lion activity. I have never had so much footage of mountain lions recorded in such a short time. This is a recent photo of a mountain lion who visited a water hole to drink. It shows one of the most glaring signs of our drought. Water holes that are usually full all year around are dry now. This one still had a little water when the lion visited it a week ago but it's now arid. Look at that lion. He is so handsome! Closer to our home, a lion went through the area visiting the "usual" marking spots. He kicked back the pine duff and urinated to leave his scent mark. The next marking spot was only short distance away but he must have detoured because it took him almost 30 minutes to get to it. I adore seeing the long muscular necks of these creatures with no bulky collars on them! Finally, the most chilling sighting was a youngish lion who examined the trail camera closely and even bit it! The main view of him was of his neck. My friends who have pet cats suggested that this was probably a young cat. It was a silly playful thing to do that a serious adult probably wouldn't waste time on. 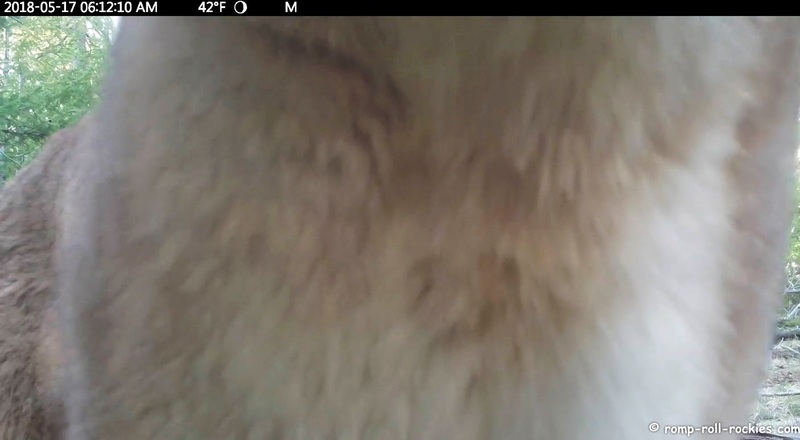 I compiled a video of all of these clips, including the lion biting my camera, which you can watch here or on Youtube. Wow - what raccoon posts! You are hilarious... and they were in your tree making babies for a long time:) Since you didn't ever mention it, I assume that they didn't have their babies in your yard! I'm amazed it is only 42 degrees! My dogs would love to feel those temps about now! 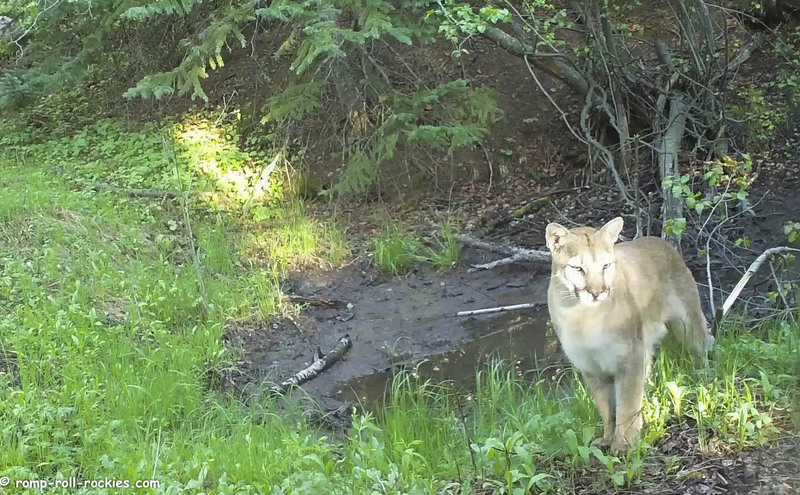 We've seen several signs of lion activity in our neighborhood as well. 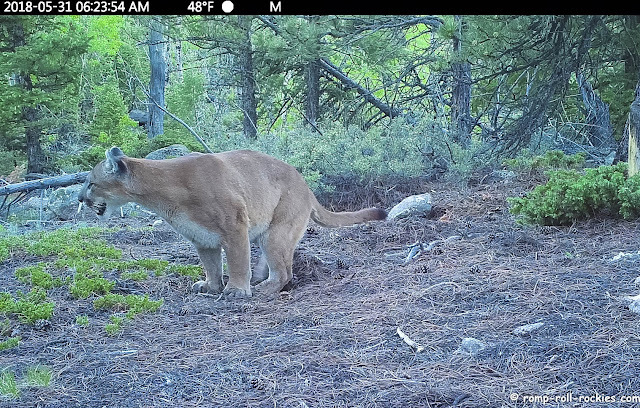 Loving your trail cam footage! The mountain lion is a beautiful creature, so powerfully built and yet so handsome. Thanks for sharing your photos and video. Happy Saturday. They are such a beautiful color and so handsome! WOW! They are so beautiful - and powerful! Beautiful footage! And I'm glad the camera survived the taste-test. Sure hope you get some rain this summer. The crazy way things are going, who knows? Maybe you'll start having frequent summer showers in the Front Range! I'd love frequent summer showers. The Durango fire is so scary. Yeowwww. Talk about up close and personal! I don't think he was much too interested in doing the selfie thing! My goodness! While beautiful, it is also scary! I pray you get rain though because these poor lions must be incredibly thirsty. Amazing footage! Beautiful animals! Hope they have other places to find water. Crikey .... they sure are beautiful creatures. Mum loves the eyes in that second photo. I hope it rains for you soon. We know all about droughts here in Australia.